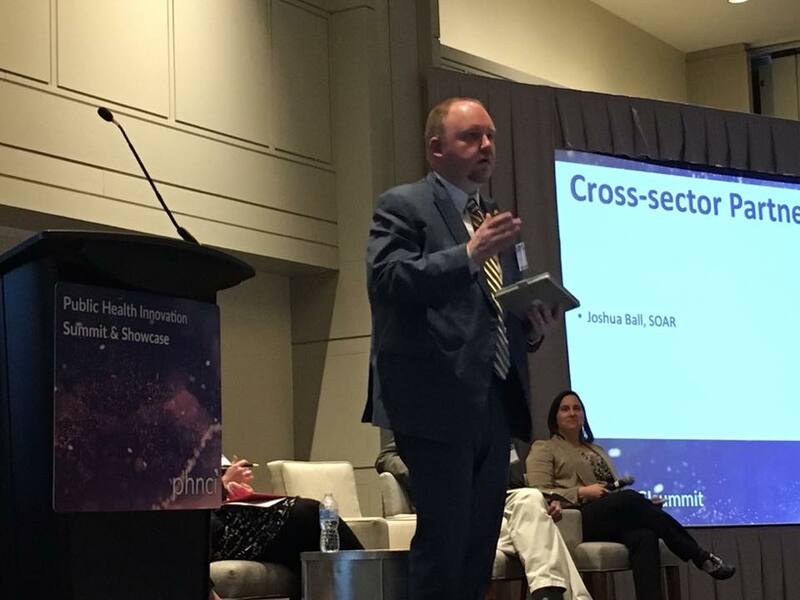 PHILADELPHIA – Joshua Ball, associate executive director of Shaping Our Appalachian Region, Inc. (SOAR), presented at the inaugural Public Health Innovation Summit and Showcase and hosted a roundtable at the Open Forum for Quality Improvement and Innovation. Both events were held in Philadelphia. The Public Health Innovation Summit and Showcase was an invitation-only event hosted by the Public Health National Center for Innovations. The audience included state and national leaders in public health, as well as foundations and other organizations working on the frontlines of public health. The event was also sponsored by the Robert Wood Johnson Foundation. Ball presented during a narrative session on Tuesday, March 26. Much like a Ted-style talk, the session was intended to share a story that highlighted innovation within the realm of public health. Ball shared the story of Allison Rose, of Letcher County, and the role of SOAR’s vast network of partners played in her journey through addiction recovery and eventually motherhood. Ball spoke of some of the public health related challenges facing the region, including heart disease and diabetes rates that far exceed the national average. Rose was arrested on June 28, 2018 for drug paraphernalia and complicity to traffic methamphetamine. For most, this could be the lowest of lows, but for Rose, it presented an opportunity of a lifetime. Kevin Mullins, a district judge in Letcher County, has been active with Operation UNITE and the HEAL (Helping End Addiction for Life) initiatives in Letcher County. Mullins began to offer those in his court the option to go to treatment if they could not meet bail. Rose took this option, but her story was different. During a medical screening, she found out she was pregnant. Within a matter of days, she was admitted to Karen’s Place Maternity Center, a facility operated by SOAR Grassroots Partner Addiction Recovery Care (ARC). That’s truly where the story began. Rose, who had dealt with addiction off and on for years, found recovery. As her pregnancy continued, she began to rediscover her purpose. Relationships began to be mend and restoration started to come one day, one week, and one month at a time. On November 20, 2018, Rose gave birth to Kayleigh Danni-Lynn Rose, a beautiful and healthy baby girl. Kayleigh required no NICU stay at the hospital. On December 14, 2018, Allison and Kayleigh left Karen’s Place Maternity Center and one of the first places Allison visited was Judge Mullins’ chamber. Operation UNITE has been a leader in the prevention community. It has established county coalitions and chapters in local schools. The collaboration of ARC and Mountain Comprehensive Healthcare Corporation and Appalachian Regional Healthcare has led to the creation of a peer support specialist network in Letcher County working to rapidly connect people with treatment. Ball also hosted a roundtable discussion on SOAR’s work on Friday, March 29 at the Open Forum for Quality Improvement and Innovation. He spoke about SOAR’s Regional Blueprint and the role public health – and health in general – plays in the 21st Century Appalachia they envision. SOAR has benefited from a partnership with the Centers for Disease Control and Prevention (CDC) since its inception. The work of CDC public health advisors has led to community and regional collaborations designed around substance use disorder, as well as other health issues such as heart disease, obesity, and diabetes. Ball encouraged those working in public health to be engaged with those working on economic and community development efforts in their state, region, county or municipality.